Southbridge Town Hall is located at 41 Elm Street, Southbridge, MA 01550; phone: 508-764-5405. Photo: William E. Alden House, ca. 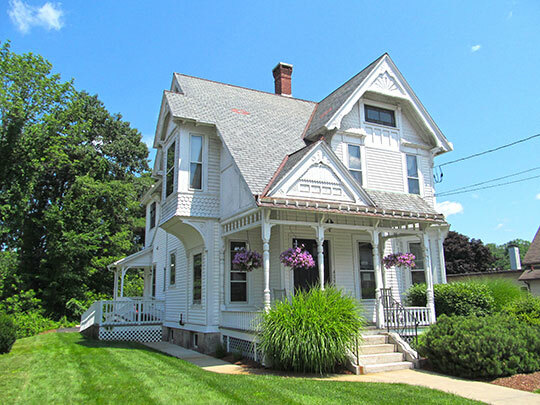 1882, 428 Hamilton Street, Southbridge, MA. Photographed by user:John Phelan (own work), 2012, [cc-by-3.0 (creativecommons.org/licenses/by/3.0)], via Wikimedia Commons, accessed January, 2015. During the second quarter of the 18th century the Southbridge area began attracting permanent colonial settlers. The first is said to have been Scot James Deneson of Sturbridge, who settled in the western part of Southbridge during 1731. Most of the early names associated with the town took advantage of sites along the Quinebaug, including John Plimpton, William Plimpton, Moses Marcy and Colonel Thomas Cheney, whose individual properties stretched across the entire town. Early settlers received their land grants from the parent towns in order to establish independent farms. The soil here was held in high esteem, and farm families pursued the system of mixed livestock and grain cultivation that characterized the entire county. The smallest portion of each farmstead was under tillage for the household garden, and fields of corn and small grains, while meadow and pasture was used for the livestock. Farm families produced a wide range of goods through household manufacture, they traded produce, manufactured goods, and labor in a system of mutual interdependence. Along the Quinebaug saw, grist, and fulling mills made seasonal use of waterpower to process home grown materials from surrounding farms. This agricultural system produced a landscape of disbursed farmsteads with no clustering. Population growth in the area was steady, and 70 years after the arrival of Deneson there were about 100 families here. As their numbers grew, area residents tired of the long trip to their parent towns' meeting houses and began to petition for independent status. Their first step was to construct a meeting house of their own, in 1797, at the corner of what are presently Main and Foster Streets, to be served by visiting clergy. The next year, eighty seven men petitioned the General Court for the incorporation of a new parish in the area. As granted in 1800, the Second Religious Society of Charlton was organized as a poll parish, an organization of ninety individuals rather than a delineation of land. The parish veered further from Commonwealth patterns in its plan to allow several denominations to share the meeting house. Rather than call a minister and gather a Standing Order Church, Congregationalists alternated services with area Baptists and Universalists. In 1808 the parish was reorganized on territorial lines, and three years later, petition for town status was made. Town status was finally achieved in 1816 when the community known as "Honest Town" including 830 individuals, was incorporated as Southbridge. The first clustering of settlement in the area occurred during this early national period. The meeting house of 1797 was built on land donated by Jedediah Marcy, whose father had developed the nearby continued mill privilege at the Center Street bridge during the 18th-century. The innovative plan of sharing the meeting house was short-lived, and the Congregationalists built their own meeting house on Elm Street in 1822, leaving the original in the sole control of the Baptists. These institutional buildings were joined by taverns in this area, reflecting increased importance of the east-west corridor south of the Quinebaug. This institutional and commercial growth was the seed of the development of the town's first, Centre Village. The continued development of mill privileges along the Quinebaug River contributed to the regional pattern of hamlets adjacent to small mills during this period. Part of the nascent industrial revolution in this country, the establishment of these small and early enterprises in Central Massachusetts towns was the result of advances in textile machinery made at the end of the 18th century. Following the successful adaptation in 1790 of the Arkwright water-powered spinning frame by Samuel Slater in Pawtucket, Rhode Island, cotton spinning mills began appearing in Massachusetts towns with waterpower resources during the first two decades of the 19th century. The first in Central Massachusetts was established in West Boylston around 1805-1806. The introduction and improvement of carding machines during the same period brought the introduction of wool carding mills along Central Massachusetts streams, in Leominster and Worcester as early as 1803. These two labor saving industries were quickly welcomed and cotton spinning and wool carding mills were established through the region, especially during the 1810s. The Jefferson Embargo and the War of 1812 cut off importation of most foreign manufactured cloth and proved the greatest stimulus to development of these mills between 1807 and 1815. Of the 96 cotton mills and 57 woolen mills erected in New England during these years, at least 28 cotton mills and 15 woolen mills were located in Worcester County towns. The largest concentration of these was in the southern half of the county, particularly in the valleys of the Blackstone, French, and Quinebaug Rivers. The first textile manufacturing attempt in Southbridge occurred at the Centre Village Deacon, George Sumner's, clothier's works and was adapted to water-powered mechanical carding in 1808. In 1811, a cotton spinning factory, capitalized at $6,000, was established at Westville on the Sturbridge border by several investors. A year later, another cotton spinning mill was set up by James and Perez Wolcott in a linseed oil mill to the east, incorporated in 1814 as the Globe Manufacturing Company. Activity at the Centre village increased so that several operations shared the water rights. Susan Ceccocci, consultant with Betsy Friedberg Massachusetts Historical Commission, Southbridge Massachusetts, Multiple Resource Area, nomination document, 1989, National Park Service, National Register of historic Places, Washington, D.C.